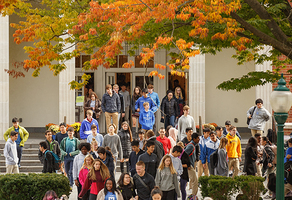 Mercersburg is a community where people of all ages and backgrounds come together to pursue one common goal: the improvement of themselves and those around them. Mercersburg’s community has the power to build meaningful relationships that bridge oceans, cross country borders, and defy generation gaps. #OneMercersburg is here! Our community has the chance to unlock $40,000 in endowed financial aid by meeting our goal of 320 donors. Make an impact at Mercersburg Academy! Connect with other Mercersburg Supporters on GiveCampus!